Fiddling, the most important aspect of any well-rounded character. If there’s one thing Xbox Live Indie Games can deliver on, its creativity. This veritable playground gives developers the chance to stretch their muscles and try things most others wouldn’t. To whit GZ Storm Games brings you Vidiot Game, offering a unique experience that’s sure to turn a few heads. In-game there’s really no set game mechanics to begin with. Vidiot Game likes to switch it up as much as possible and throw all kinds of different tasks at you. For the most part, though, movement and selections are done with the left analog stick, and player actions are done with the face buttons. Graphics and sound are a mixed bag, never letting you settle in one style for too long. You’ll be sticking with a highly detailed hand-drawn mix most often, but don’t be surprised when it gets switched out for vector style graphics, or even quickly drawn doodles. The pure randomness of the imagery you’ll be presented can be stifling at first, but learning not to question and merely going along with it is something that is learned quickly. The soundtrack adds to the experience, which is mainly to confuse you. Some tracks stand out with a sort of polished 8-bit charm, but for the most part the music’s theme seeks only to destabilize the small amount of coherency you have while playing. As for gameplay and story, I might as well wrap them together, as they seem to be one in the same. If you try to categorize this game in terms of a story, you will fail. As for objective, or ulterior motives for that matter, it becomes much clearer. Vidiot Game represents itself in a very clear, brazen way to the player that has a “like it or leave it” style of play. The name of the game here is confusion; or more directly, confusing you. Within three seconds of reaching the title screen you will most likely be confused. If you manage to avoid this, undoubtedly upon starting the game and reaching the character selection/creation screen, you will be confused. Not because of an inability to interact or access the game, there’s plenty of that going on. You’ll be confused by the game’s first attempt to completely fool you of its actual identity, putting forth a ruse as to it being an intense RPG-type experience — not to mention that the three characters you’ll be playing as are a potato, a frying pan and a mushroom. 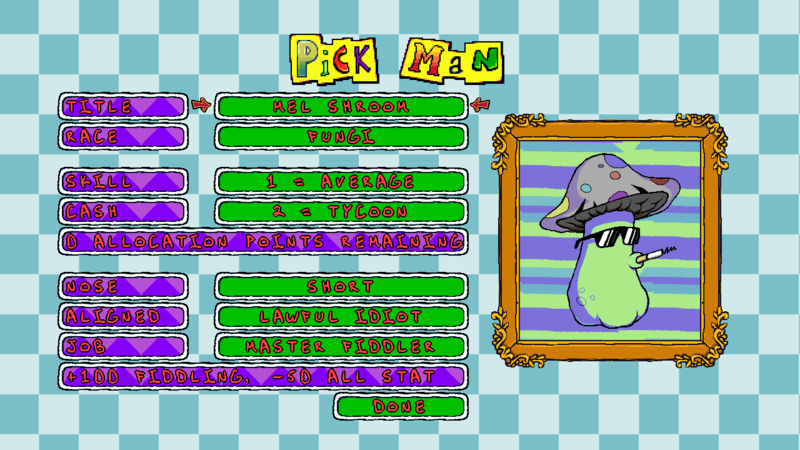 From there, a WarioWare style of minigame progression takes place, a progression that is randomized with the exception of a few games leading into others. Some of the games are straightforward, such as flying down a tunnel dodging walls; others find you doing more outlandish tasks, like how to handle a dead horse you’ve just stumbled upon. Yeah, they get weird. They’re quick and easy, getting their point across of, once again, confusing the hell out of you. This is also a game you can win, but upon doing so, you may question what kind of victory it was. The experience is the key factor here, and this is likely to be a game that you won’t soon forget. During gameplay, some minor details distract from the experience. A sort of glitch graphical effect is added whenever your character gets an ailment, which makes it difficult to read and see what’s happening on screen. Character hit boxes are also hard to judge during segments when running past objects is necessary, and the number of minigames could also use some boosting — after a few attempts to conquer the madness you’ll likely run into the same games over and over. Through it all, though, Vidiot Game retains a shine that’s unique to the Xbox Live Indie Game Marketplace. A true oddity in the Marketplace, Vidiot Game offers gameplay that’s unique, confusing and well, confusing. At the very least, download the demo and give this title a try.